News and Information from Benchmark Civil Engineering Services, Inc.
PennDOT regulates activities within their road right-of-way through the issuance of Highway Occupancy Permits. By regulation, a permit is required whenever a access point or utility are installed or whenever other modifications are made to or above the the PennDOT right-of-way. Most commonly for Benchmark, these permits involve the construction of a new driveway or other improvements associated with a new development or a municipal improvement project. Many existing driveways and utilities were constructed prior to 1982 when PennDOT began their current permitting requirements. These facilities are generally not “grandfathered” however some municipalities do not require that permits be obtained as part of land development projects for these older facilities unless they are being modified. Often permits are also obtained when utilities are installed. Most major utility companies (water, gas, electric,sewer) have a contact with PennDOT which assists them in obtaining permits because they are generally routine in nature. Stormwater pipes which cross the PennDOT right-of-way are permitted to the local municipality who is then responsible for the maintenance of those pipes, inlets, and associated structures. Frequently, when a permit is issued for a stormwater pipe related to a development the local municipality will assign the responsibility and cost for maintaining the stormwater pipes to the developer. The Highway Occupancy Permit is still issued to the municipality but the developer enters into an agreement with the municipality. Benchmark has extensive experience with designing facilities and obtaining permits from PennDOT for new and existing driveways as well as utilities. 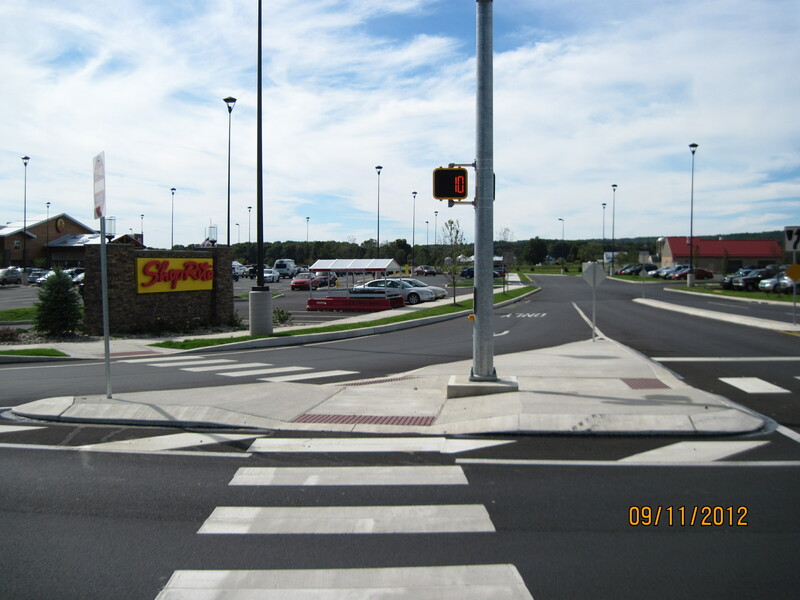 We have also completed projects involving overhead conveyor facilities crossing PennDOT right-of-ways. Please contact us to discuss your permitting needs. We have successfully prepared Highway Occupancy Permits for numerous private clients, municipalities, and school districts. Benchmark recently updated their web site to provide additional information for our clients and potential clients. We have a direct link on the site to our Bencivil Blog where we regularly post updates to changes in PennDOT regulations, infrastructure funding, and insights into the civil engineering services we provide. You can also see our You Tube video describing our services from the website or via the link below. On March 19. 2013 the American Society of Civil Engineers released the 2013 update to their National Infrastructure Report Card. The report card assesses the condition of America’s infrastructure in 16 categories. The overall grade was a D+ which is an improvement over the 2009 assessment which had an overall grade of D. The major areas of improvement were the rail system and the highway bridge system. The rail systems benefitted from significant private investment in the rail freight system and an improvement in the number of users of the passenger rail system. The highway bridge system improved slightly because of a general change in the State Department of Transportation’s programs to favor maintenance of existing facilities over expansion of the roadway system. The Bridges category received a C+ grade, In Pennsylvania, PennDOT has made a major effort to address structurally deficient bridges over the last five years. Unfortunately, because of the age of Pennsylvania’s bridges each year many additional bridges fall into the structurally deficient category. Currently 25% of Pennsylvania’s bridges are structurally deficient; that’s right, one in four bridges are structurally not able to carry their design load. As part of the report card release, ASCE held their legislative Fly-in. Pete Terry was proud to be one of eight representatives from Pennsylvania who met with Representatives and Senators from across the State. The main focus of the visits was to share the updated Report Card findings, discuss the next Transportation Funding Bill (MAP 21, the current bill, will expire in September 2014) and to discuss the Water Resources Development Act which provides funding for dam safety, harbor improvements, and improvements to the system of inland waterways. In general, is seems that our federal legislators are beginning to understand the value of infrastructure to creating jobs, competitiveness, and our standard of living. The current fiscal constraints and a reluctance to increase user fees continues to hold back support for increased funding. ASCE indicated three key solutions to increasing our infrastructures grades; (1) Increase leadership on the state and federal levels in infrastructure renewal, (2) Promote sustainability and resilience in the design and maintenance of our infrastructure, and (3) Develop and fund plans to coordinate all transportation modes and their funding. During this week, progress was made on one of four major issues currently before the State Legislature. The plan to privatize the State’s Liquor Stores passed the State House and the plan now moves onto the State Senate. The Governor has indicated that he supports privatizing the liquor stores. The other three major issues before our legislators are a plan to fund transportation infrastructure, the State’s budget, and reforms to the State’s pension system. As part of the Governor’s budget address in early March he has introduced a plan which would reduce the State’s portion of the fuel tax but lift the cap on the wholesale fuel tax. This plan, along with some minor changes to registration and license fees would be phased in over five years and would eventually raise an additional $1.7 Billion to fund transportation infrastructure. The Governors funding commission released a report in August of 2011 indicating that funding at the level of $2.8 Billion per year would allow sufficient funding to allow us to maintain our roadway and mass transit systems at the level they are currently performing. Several legislators have suggested that when bills are introduced in the House and Senate they may include higher funding levels to allow for the maintenance and potential improvement of our transportation infrastructure. The annual battle over the State’s budget will likely be contentious, however, the State’s revenues have shown some growth as it appears the economy in Pennsylvania has stabilized and may actually be growing slightly. The issue of Pension reform is a very difficult battle. It is likely that new workers will receive different less costly retirement plans than workers in the existing system. While private industry has moved away from defined benefit programs in favor of defined contribution programs the State government has continued to resist this change. On Thursday February 28, 2013 ten state representative from across Pennsylvania held a hearing at the America On Wheels Museum in Allentown. The purpose of the hearing was to gather public input concerning the Governor’s proposed transportation funding plan and needs of our state’s citizens. Pete Terry presented the Greater Lehigh Valley Chamber of Commerce’s Transportation Funding Policy. Representatives from PennDOT, LANta, and other interested groups also provided testimony. From the discussion following the presentations it was clear that there is an understanding that the Governors proposed $1.8 B funding program will have a significant impact on improving our infrastructure but will fall well short of the needs which have been identified. A link to the Easton Express news article on the hearing is below. We have a new RSP Congratulations Peter Terry! MS4 – What is it?